It was a grey Wednesday when Marylou McDonald and I set out to Gaithersburg to see Anne Connery, but the grey faded the moment we were greeted at the door by Anne in her soft Southern welcome. A stately woman who has had life's share of joys and burdens, she is a gentle, spiritual woman with a core of iron, I would say. 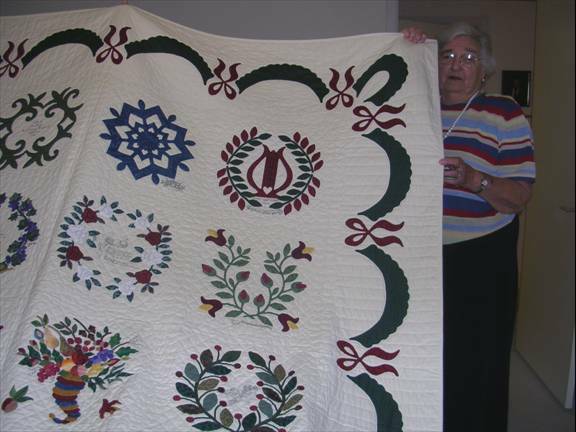 I was there to interview her and to see her quilts. Marylou is Anne's friend of many years. We immediately were drawn to the airy sewing room off of her living room. 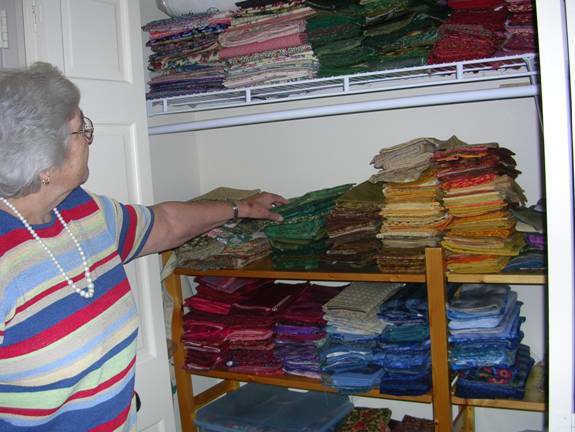 She showed us the brilliant array of fabrics which have been severely pared down when she and her husband, Larry, moved into the retirement community of Asbury Methodist Village. 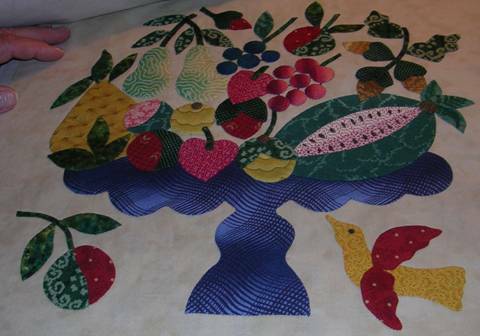 From her fabrics we moved to the blocks of another Baltimore Album that she is ready to put together: "I don't make quilts; I make blocks" is her famous saying, but her beautiful art of appliqué tells me that she doesn't quilt because she wouldn't have time to do that part of her creation. 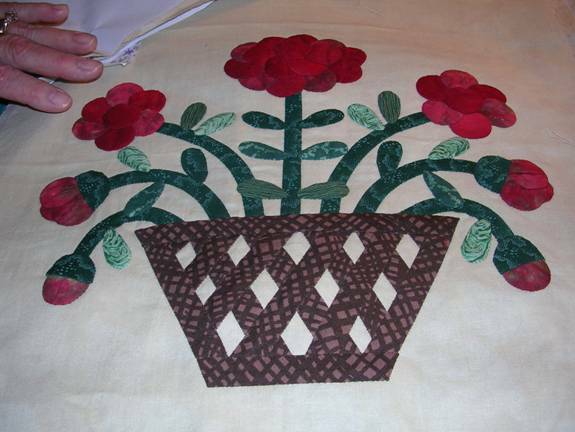 Anne Connery's grandmother quilted, with patterns from paper bags, using fabric left over from the dresses that she had made for her family. Anne was delighted to recognize squares in the patchwork of her own dresses, in Edenton, North Carolina, a picture-book coastal town filled with Victorian houses where she lived as a girl, only several blocks from her grandmother's home. 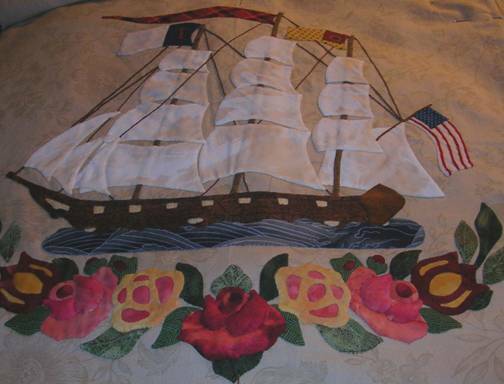 Her mother sewed clothes by necessity, but did not quilt. 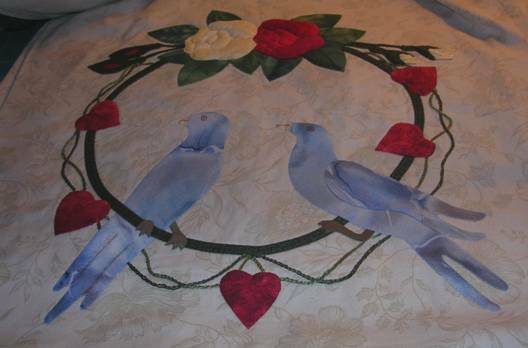 How many of us have the skipped generation of quilters--grandmothers and now their granddaughters quilting as a passion, creating an art, rather than the patchwork quilts we slept under? Certainly Anne had no time for quilting until she retired. She grew up very quickly--as many young people did; she is 79 years old. She studied pre-nursing under a teacher who steered her to the University of MD's nursing school in Baltimore. Here she worked hard, nursing and studying with a half day a week off. Anne remembers visiting the Hippodrome to see "The Bells of St. Mary's" in pairs, of course, for safety. After graduation she returned to a small hospital in Edenton where at age twenty-three she became Director of Nursing. From Edenton, she followed her friend with whom she had worked since nursing school to Charleston, WV, again obtaining leadership in a nursing school--she chaperoned students when she was twenty-five years old. She was encouraged to go further by joining the Navy and she moved once more to Portsmouth Naval Hospital. in the month of February and "on the following April Fools' Day," Anne adds with a smile, she met her future husband, Larry, an engineer also in the Navy. There were several moves before she and Larry and their three children settled in the Washington DC-Baltimore area. Here she was a homemaker and then a nurse in long term care also teaching at Montgomery College and Hebrew Home and writing programs for respite care. In 1989, Anne broke her leg--"it was time to retire." But she missed the camaraderie of friends and work. Larry said, "You have to find something to do!" And indeed she found something to do when she was invited to Friendship Star Guild at the Montgomery County Library where a special speaker was presenting and showing four appliquéd quilts--Elly Sienkiewicz, of course. She returned home and told Larry, "I have found out what I want to do! He groaned knowing how I went after things that I wanted to learn." She entered Mimi Dietrich's class at Seminole Sampler and Mimi "led us down the path." Anne said that she wanted to stop people on the street to tell them of this "thrilling" art she was learning. She always returned home full of excitement, so much so that her husband's friend called the president of Adult Education in Montgomery County and got her to teach a class. 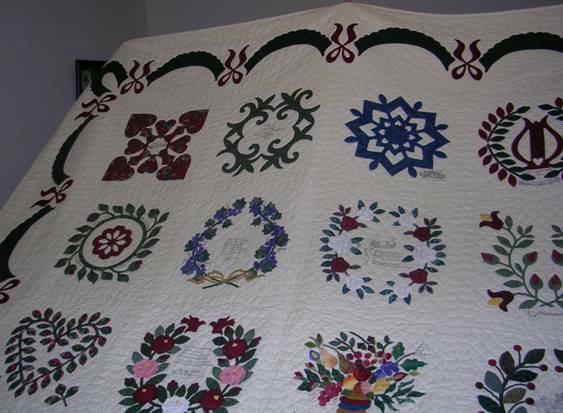 Reluctantly she accepted, having not completed a quilt herself. "I was so prepared for the first class, I had to have a hand truck to carry things; and I thought 'well if I run out of things to teach, I'll teach nursing.'" 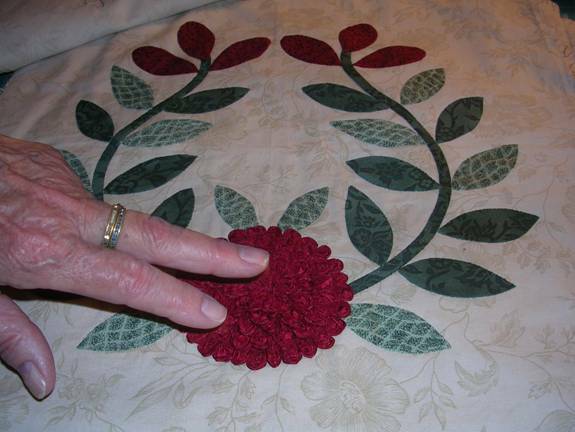 Larry quipped, "Are you going to tell them how many quilts you have made?" 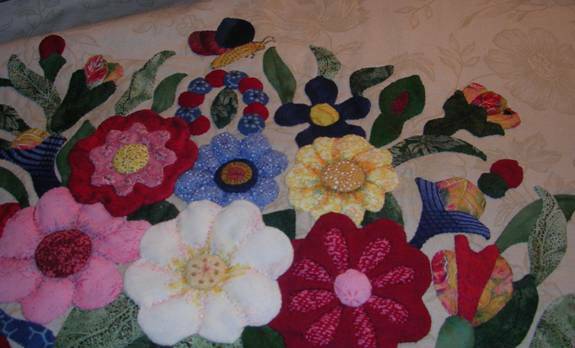 Thus began Anne's famous line, "I don't make quilts; I make blocks." 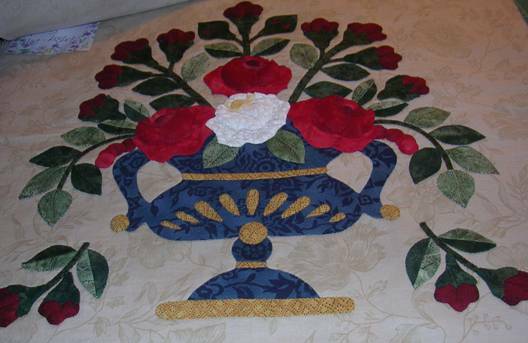 Anne has gone on to teach many classes in many places: G Street Fabric, MAQ conference, Elly Sienkiewicz's AppliqueAcademy in Williamsburg and she is teaching still near her home. She has touched many people. 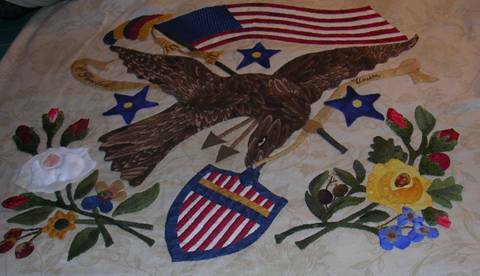 Elly Sienkiewicz words at the March 2002 award of a Friendship Quilt to Anne, on her 75th birthday, show the depth of feeling her friends and students have, "I know you have met her, the teacher who changed the way you felt about quilting, lifted your spirit, or inspired your artistic soul." Anne says, "The Lord opened this beautiful window for me. So much has been given to me, I must share with others." The peace within Anne fills her face as she ushers us reluctantly to her door. She has invited me to visit again. "You have to live a little to quilt" are words I will treasure as I will treasure this time with her.